Completely renovated in 2009 to a high standard Chalet Maria provides comfortable, self catering accommodation for families or groups of up to 7. The accommodation comprises 2 bedrooms, kitchen/breakfast room, lounge/diner bathroom, cloakroom and covered veranda. There is parking on the paved drive for 2-3 cars and a large grassed garden to the rear. Chalet Maria is situated in Strba, between the High and Low Tatra (Tatry) mountains, within the village are several small supermarkets, restaurants, take away pizza's, hardware store and 2 churches. The area is ideal for skiing, hill walking/mountaineering, fishing, cycling or just relaxing in one of the nearby thermal spas. Aquacity in nearby Poprad provides plenty of flumes and swimming pools (one of the first carbon neutral water parks in Europe). Being more or less on the border of both the Spis and Liptov regions there are also many other tourist attractions, restaurants, shopping centres and activities within easy reach. My wife Maria introduced me to her beautiful country in 2005, being someone who loves the outdoors and wild countryside I loved it straight away, so much so that we bought Chalet Maria in 2007 and married in Slovakia three years later. We both live and work in the south of England where we enjoy looking after our cats, the garden and getting out to explore the countryside whenever we can. But it's not just the peace and quiet we enjoy, we also love cinema, socialising, eating out, live gigs and theatre. Maria also sings in a local choir and I help to run the local cub pack, so it's a busy life that we lead! Our holidays are also a mixture, we both like to explore and see the sights but also find the quiet places and countryside to relax in. Just like Chalet Maria! This part of Slovakia offers 3 national parks within 30 minutes drive, High Tatras, Low Tatras and Slovak Paradise. Each of these has a different character and geology, but all are fiercely protected by their governing bodies, they are areas of amazing natural scenary, unspoilt by agriculture or over skiing. 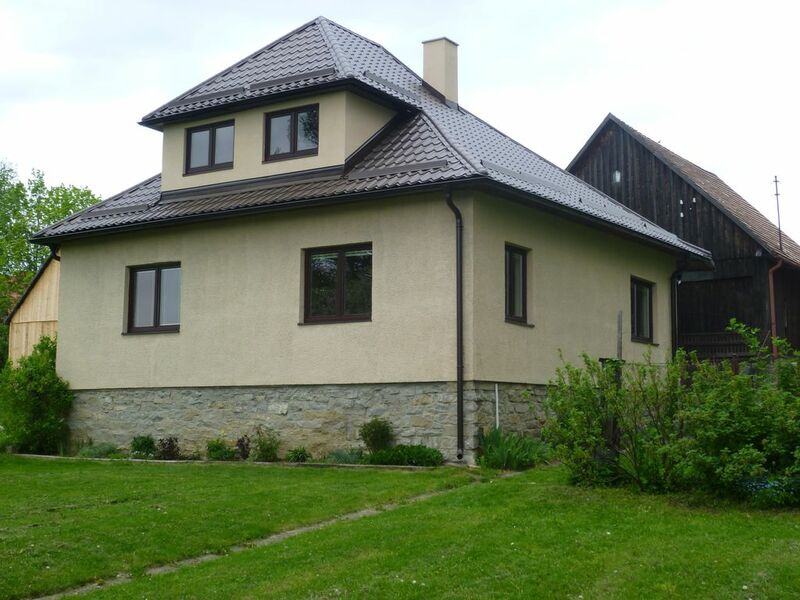 This is why we opted for a property in Strba which itself is a very accessible location, it is close to the new east-west D1 motorway, main line railway and Poprad airport, so it is pretty easy to get to. Strba is a small traditional village with all the necessities for a pleasant stay, waking up in the morning can be quite difficult because it is so quiet and peaceful! Poprad is about 15 minutes away and offers all of the shopping & restaurant facilities you could need, including a huge Tesco's and plenty of walking/ski gear and souvenir shops plus a new shopping mall. Bathroom - large shower, wash hand basin with mirror unit (with electric shaver socket), heated towel rail, infra red heater and corner cupboard unit wc. ceramic tiled floor. Cloakroom - directly off hallway this provides a separate wc and basin. Large room with corner sofa, 2 armchairs, coffee, dining tables dining chairs, TV and contemporary style, wood burning stove (heating also by electric convector heater). The room has wood laminate flooring and 2 large double glazed windows with views. We have a large refrigerator/freezer in the kitchen. A light & spacious fitted kitchen with electric hob and oven, washing machine and fridge/freezer. Other equipment provided includes microwave oven, toaster, kettle, saucepans etc, cutlery and crockery. A small table with chairs is suitable for breakfast. The house is a single storey building, but there are a few steps down from the drive to the house (these have a wheelchair/pushchair ramp) and from the house down to the garden. Notes on accommodation: Included in the price are: Clean bed linen, towels and tea towels. Electricity, heating and hot water. Logs for wood burning stove. An electric hairdryer is also provided for convenience. Outside: The property is entered via a large driveway/footpath, the drive can accommodate up to three cars behind lockable gates. To the rear of the house is a large, mostly lawned garden, we have planted some flowers, bulbs 4 fruit trees (one day we will make our own Slivovica!) and have inherited a large number of very productive black and red current bushes-please help yourselves! Alongside the driveway is a large traditionally built wooden barn and a smaller barn between this and the store room, this can be accessed by arrangement for additional storage for bicycles etc. A split level patio area adjoins the property, furniture and a charcoal burning BBQ are included to provide the perfect way to enjoy the Slovakian summer evenings. Cleaning / Towels / Linen / Maid service: All bath, hand and tea towels are provided on a weekly basis along with bedlinen. The house is thoroughly cleaned prior to occupation and on a weekly basis, additional cleaning can be arranged directly with our housekeeper if required. Other: Within the hallway a wooden unit provides coat hooks, mirror and some additional storage, a fully enclosed veranda runs along two outside walls providing useful space for storing wet gear such as walking boots, cagoules or skis. We had great holiday here. Cosy accomodation. We came back to it, every evening , like it was ours. We felt like home here. The house is fully equipt. You have everything you need. Hanna, the house keeper is very nice and helpful. We want to return. I spent a long weekend here with a group of keen hikers and we had a great time here. Chalet Maria was an ideal base for our hikes. Hana was really helpful when we needed any assistance. We loved the bungalow that was situated in an ideal location for our walking holiday. The bungalow was well equipped and spacious. The kitchen had everything we needed except a dishwasher. The rooms had been well modernised and it was lovely to live in a home as opposed to a holiday apartment. Hana, the housekeeper was lovely and could not have been more helpful. One minor comment is that although the double bed was very wide, it was also short, so at 5'11", my feet hung over the end, which was quite nice after a hard day's walking! Poprad airport is about 15km and takes about 15 minutes on the motorway, there are direct flights from London (Luton) to Poprad. Kosice Airport is about 146 km and takes just under 2 hours, this will improve as more of the motorway is completed. Bratislava airport is about 300km and takes about 3 hours by car. Krakow airport (Poland) is about 175km and takes about 2.5 hours by car. Within the village are several small supermarkets, restaurants, cafe, take away pizza, hardware store and 2 churches. Poprad is the nearest large town and is 16km (12 miles) away and takes less than 20 minutes by car, there is a very large Tesco superstore on the Strba side of town for easy parking and shopping! The area is ideal for skiing, hill walking/mountaineering, fishing, cycling or just relaxing in one of the nearby thermal spas, Aquacity in nearby Poprad provides plenty of flumes and swimming pools (one of the first carbon neutral water parks in Europe). Being more or less on the border of both the Spis and Liptov regions there are also many other tourist attractions, restaurants, shopping centres and activities.